One of my New Year’s resolutions was to cook more. Part of my reasoning for this was that I wanted to eat healthier. In the past, I’ve begun the year with a "Lost 20 pounds in 20 weeks challenge." I could use one of those again this year as I’m almost 30 pounds above where I’d like to be. That being said, however, I’m going to try a couple of weeks of an informal diet. I’m going to cut down on the snacking, eat less and focus on eating healthier food. I’ll dine on more salads and snack on less junk food. In addition, I’m going to try to work out more. I think I’ll break out the EA Sports Active and break a sweat. There are going to be two challenges for this. The first is the cold weather. With such a chill in the air, I’d much rather bundle under my Slanket and let my laptop warm up my lap. It’s been over a week now and I’m still sore and achy. My neck still hurts when I move it and I get shooting pains down my right arm. I’m not going to let that stop me, but I will take it easy at first. My other change, rather than not going with a formal diet, is that I’m not going to update every week. Honestly, for some of my "20 pounds in 20 days" posts, I began to reach for content. I couldn’t think of anything to say other than "Hey, I lost another pound this week." While it was nice to know just what I was posting about, I’d rather have more substantial posts. So I’m just going to post an update every first Monday of the month instead of every Monday. I may also put something on the sidebar to help keep track of my weight loss. So that’s my plan. Wish me luck. 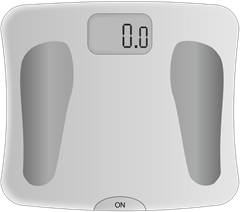 Disclaimer: The body scale clipart above comes from OpenClipArt.org.